Your bathroom is a place for different experiences. From get-ready-fast for work or school in the morning, to feel-good while having a bubble bath in the evening. It is the room in your house that needs a carefully thought out design. Building a proper bathroom according to your taste, needs, and budget is not so difficult if you plan it beforehand and do the right research. There is a lot of material available online. Take your time and select what you like most. Consult some experts. Although their fees can be high at times, it is better to have an informed design than regret the results later on. Consider the style of your house, your preferences and those of your family members. Also, consider a realistic budget. Additional options such as mirrors, are affordable and can create space in a room. 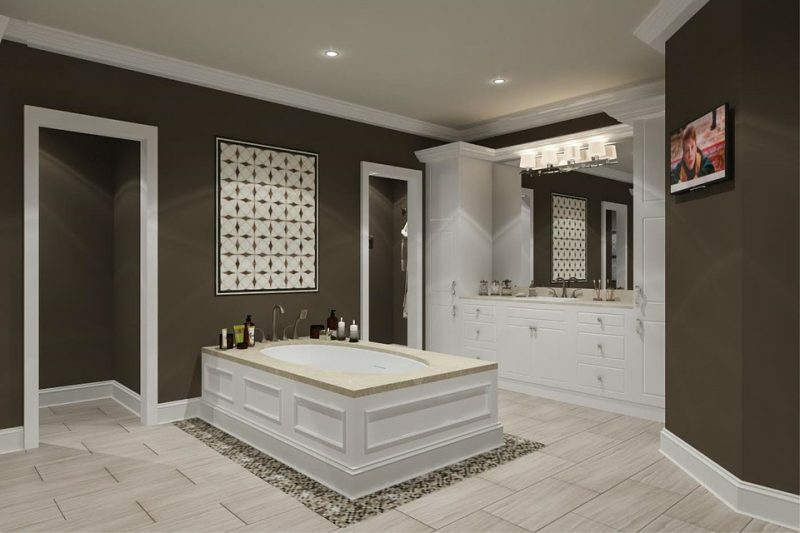 Take into account the value a bathroom makeover could add to your house. Sometimes, spending a bit more can result in a higher selling value for your property. Continuing from last year, 2019 will see bathrooms built utilizing one material for everything, including floor, ceiling, and walls. The most common practice is using tiles, but you will also see plaster, marble, and concrete. The homogeneity of the environment creates an impact that is very appealing to the eye. Open-concept designs are becoming more and more popular. The bathroom spaces are no longer being hidden away, and are now sometimes integrated into the design of the room. These designs are very appealing to the present fast modern lifestyle, where getting ready for a busy day becomes a pleasant experience. A nice benefit of these designs is that they add light to the room, creating a relaxed spa-like environment. Many bathrooms are now designed with a barrier-free shower that produces a unified look throughout the space. Likewise, should the space allow for it, you can also install a freestanding bath, making it the centrepiece of the room. These come in various shapes, sizes and designs, so make sure you do your measurements and pick one that is best suited to the space available. It’s important to remember however, that this open form of design might not be for everybody! Looking towards the past, exposed piping is coming back, but in a more stylish manner. It looks very beautiful with white marble. Particularly, the exposed hardware in the shower brings an air of old, solid structure that has lasted for several generations. Painting exposed piping can add colour to your bathroom. Mirrors of different shapes and sizes are an affordable way to make a statement in your bathroom. They can create a unique look, and transform the room, giving a fresh and bigger sense of space. For this reason, they are a great option to consider in cosier bathroom spaces. 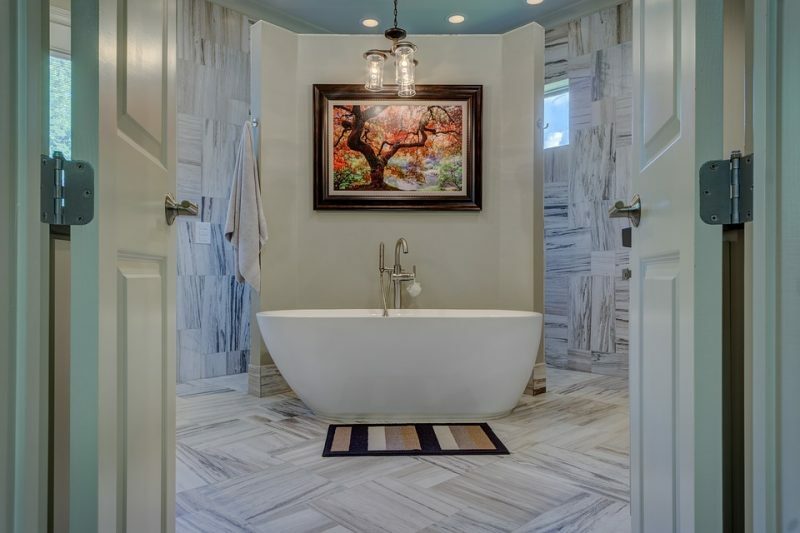 The trend for marble in the home has surpassed demand for other materials over the years. Although the initial expense can be off putting, the use of marble can transform the aesthetic quality of your bathroom creating a relaxing environment and adding a significant touch of class. Concrete is also in vogue, and when properly designed, it can transform your bathroom into a place of comfort and serenity, with the additional advantage of being very affordable. Where concrete is used it is often offset by wood, in order to create a warmer feel. Floor tiles can really tie together the look of the room. Tiles featuring chevron patterns are tipped to be a prominent trend for 2019. They’re eye-catching, making them a great option for a quirky bathroom aesthetic. Terracotta tiles are also becoming very popular due to the rustic, homely feel they can create. Natural stone tiles are also trendy in rustic or contemporary bathrooms. However, they may require a waterproof coating to tolerate the moisture in the bathroom. The main advantages of both of marble and natural stone tiles are their durability and resell value. When dreaming up a new aesthetic for your bathroom, lighting can sometimes be left out of the mix. However, it’s important in bringing a sense of wholeness and energy. LED lights are a favourite choice, due to their capacity to produce a calming effect, and reduced energy consumption. They also produce a fresh and clean look in the room. Adding different layers of lighting is something to consider. One that ensures that light is distributed evenly, a second one for grooming activities, such as shaving, and finally an intense one that highlights the candour of the room. 2019 promises to be a good year for interior design in all its various forms, so why not kick it off by taking a look at what can be done in and around your house. Perhaps this might be the year you finally turn your bathroom into that calming aquatic oasis you’ve been dreaming about. Thinking of carrying out a bathroom renovation, but not sure where to start? Why not book a call with our team for expert advice on how to get the project off the ground. Sofia is a writer from Sydney. She is passionate about decorating houses and engaging in home renovation projects and sharing her experience and advice with other people through her writing.